Papers: Correspondence and papers in Lincoln Gordon papers, 1936-1970; Pierre Salinger White House staff files, 1960-1964; Godfrey T. McHugh White House staff files, 1961-1964; Dean F. Markham White House staff files, 1962-1965; Myer Feldman White House staff files, 1961-1964; Charles Antone Horsky White House staff files, 1961-1965; Christian Archibald Herter White House staff files, 1962-1967; Richard E. Neustadt papers, 1949-1972; and Lawrence F. OBrien papers, 1960-1972. Papers: In Paul A. Shinkman papers, 1924-1969; John Llewellyn Lewis papers, 1879-1969, available on microfilm; Alexander Wiley papers, 1913-1967; National Press Club speech (1969), 1 tape recording; Wisconsin Scientists, Engineers, and Physicians for Johnson-Humphrey records, 1964-1965; William Finlator papers, 1935-1992, available on microfilm; United Packinghouse, Food, and Allied Workers records, 1937-1982; Gore Vidal papers, 1888-1992; Tere Rios Versace papers, 1941-1977; Dore Schary papers, 1920-1980; David Schoenbrun papers, 1963-1978; Richard Rovere papers, 1931-1968; John B. Oakes papers, 1932-1969, on 6 microfilm reels; videotape and audiotape of 1968 convention address in National Association of Broadcasters records, 1938-1982; Clark Mollenhoff papers, 1936-1990; James Combrowski papers, 1897-1983; Carnegie Commission on Educational Television records, 1954-1954; Irving Caesar papers, 1905-1972; Roland Evans, Jr. papers, 1963-1973; Kenneth Gale Crawford papers, 1911-1983; and transcript of The Twentieth Century interview in Burton Benjamin papers, 1957-1985. 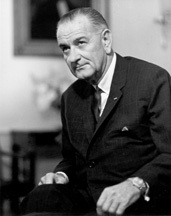 Papers: Typescripts of Lyndon Johnsons memoir, The Vantage Point, and Lady Bird Johnsons A White House Diary in Margaret Cousins papers, 1921-1973. Also in Jessica Mitford papers, 1949-1973 (bulk 1961-1973). Papers: Information concerning work as Johnsons staff assistant in Brooks Hays papers, 1916-1982.